Being a pet blogger has afforded me a multitude of incredible opportunities, from pampering my cats with items to review that they most likely wouldn't have gotten otherwise, having a platform to shine a light on the importance of saving lives through adoption, to becoming a small part of an amazing community of like-minded animal lovers who have become dear friends. 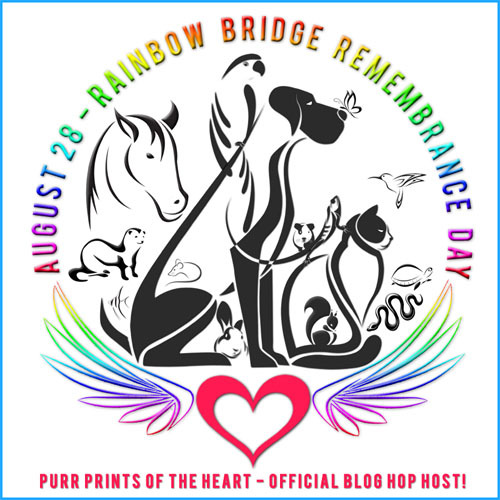 But absolutely nothing will ever compare to the day I received an email with an exclusive invitation to visit a place that anyone who has ever lost a cherished pet has dreamed about and formed an image in their mind of what's it's like - the Rainbow Bridge. It was all very hush-hush. I couldn't share with anyone where I was going, and I had to accept and be ready to go that very afternoon. Of course there was never a doubt in my mind that I was going, and as soon as I was able to come to terms with the gravity of what was about to happen I started making phone calls and sending emails to make excuses that would explain my absence for the rest of the day. There was one other caveat to my trip - after it was over I would obviously be able to share my experiences, but I had to promise to never tell anyone how I got there. After all, if pet lovers all over the world knew how to visit their beloved fur babies one more time there would be a rush at the gate and all peace and tranquility would be gone. I knew it would be hard to keep this information to myself (and the temptation to use the knowledge to visit again is strong), but this was a once in a lifetime opportunity and I had to accept the wishes of my hosts. I'm happy to tell you the Bridge is every bit the beautiful, magical place we've always hoped our babies go to after they leave us. Upon my arrival I was escorted through the gate by a ghostly white cat who introduced herself as Misty. As I looked around trying to take it all in I saw a place where every animal lived in harmony. Cats, dogs, birds, hamsters, iguanas, every animal you could possibly think of was playing together and getting along like they were the best of friends. Toys, warm beds and blankets, bowls full of yummy treats, every creature comfort that our pets enjoyed in life were readily available everywhere you looked. Animals that had never known a kind word or gentle touch on earth were now happy and carefree as their lives were meant to be. Misty escorted me to a private room where I was told I would have a chance to have some time with each cat I had shared a bond with in my life. I was a bundle of nerves as I sat there waiting on the couch, hesitant to stir up old memories yet blissfully happy at the same time. The door opened and Patch and Sebastian, my two childhood cats walked in. These guys were like little furry brothers to me growing up and it had been over 2 decades since I'd seen either of them. They were both excited to see their big "sis" again and eager to catch up on the news of what's been going on at home with my parents since they've been gone. Then Sashi and Tara strolled in together - the first two girls I adopted as an adult who turned me into the cat mom I am today. They were both just as beautiful as I remembered. I was so happy to see that all the cats I'd shared my home with were now the best of friends as each told me they enjoyed spending time together, sharing memories of their time living with me. Everyone got a tummy rub and lots of cuddles and kisses, then Misty came in and announced I had more visiting to do. I got to briefly spend time with neighbor kitties I had befriended through the years - Tommy, Squirt, OC, Terpsie, Squiffy, Milton and Cooper - just to name a few. I was even able to catch up with Mooch and Pop Tart, two neighborhood strays I had brought to a local rescue, then lost track of after they'd found their forever home. It was so good to hear that my intervention had given them the chance at a wonderful life they wouldn't have had if they'd continued to live on the streets. Minutes seemed like hours as I waited for the one I so desperately needed to see one last time. Finally a little tortie face appeared in the door. She ran across the room into my arms. I held her as tight as I could and sobbed into her silky soft fur, wondering how I was ever going to force myself to let her go again. Then a tiny voice said, "I was afraid you were going to be mad at me." I looked into that precious, innocent face. "How could I ever be mad at you?" "Because of what happened...that night. I was supposed to take care of you for years and years but I just couldn't hold on. I was hurting so bad." "Oh baby I know you were. It wasn't your fault. You had a blood clot in your heart and the vet said nothing could be done, it was just your time. But we both know that's not true because we were cheated out of so much time together." "I miss you so much, Mommy." "Truffles, I didn't know a human heart could hurt as much as mine did the day I lost you. Do you remember that night at the emergency vet when you were in the oxygen cage and I promised you I'd be back in the morning?" "I remember how scared you looked. I didn't understand what was going on." "I didn't either, sweetie. I had never even heard of a saddle thrombus before. Ever since that night I've lived with the regret that I left you. I should've demanded to stay with you. Right after I left you crashed. The vet called me at home and advised that I let you go, and I asked her to keep you comfortable because I wanted to be with you at the end. Then your grandpa and I got held up by a road crew painting lines on the highway and we had to take a detour. By the time I got to you it was too late. I still can't forgive myself for not being there for you when you needed me. We never got to say good-bye." "I forgive you, Mommy. I let go because I didn't want that to be your last memory of me. We didn't have a long time together but you gave me more love in the time that we did have than many kitties get in their entire lives. I've heard some pretty sad stories from the animals I've met up here. I'm thankful for the life I had." "How'd I get such a brave, wise girl?" I asked her. "Are they taking good care of you here? Are you making new friends?" "Oh yes, everyone has been so nice. When a really young animal like me arrives unexpectedly and is still super scared and sad everyone pitches in to make sure they're never alone and to show them how to watch over their grieving humans. I hope you've been able to feel me near you and that I picked out the purrfect new kitty to send your way. When Mudpie applied for the position I thought she seemed like such a sweet, fun girl." "Mudpie is pure perfection in every way. You couldn't have done a better job. She's been such a comfort to me over the past 2 years since you've been gone." The door opened and Misty poked her head in. "I'm sorry but you're going to need to wrap things up. We have to get you back home, Melissa." I didn't even realized I'd been holding Truffles in my arms this whole time. She looked up at me as I said, "I wish I could stay with you." "I wish you could too but there are still a lot of kitties on earth that are going to need you. I'll be right here waiting for you when you come back in 40-50 years. Then no one will ever be able to separate us again..."
I turned over and slammed my hand on that annoying alarm clock, upset that it had interrupted my beautiful dream. Mudpie was beside me, kneading the blankets. "Mommy, are you okay? You've been crying and talking in your sleep. I was scared." I pulled my sweet girl up onto my chest and gave her a kiss. "I'm fine, sweet pea. I was just catching up with some old friends." Wow, what an amazing and beautiful story. Purrs to you today... and a High Five for your story. What a beautiful, hearttouching story. This is beautiful beyond words, Melissa. Such a special, stunning way to remember your sweet angels. Thank you for sharing this with us. What a beautiful story, and an amazing way to remember your cat companions--especially Truffles. Beautiful story...sending you lots of purrs on this day of remembrance. Oh Melissa...this was so touching and beautiful...so much more than I could have ever imagined. 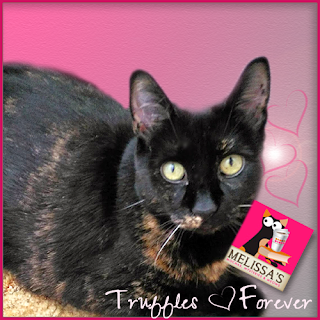 Thank you for sharing this special journey through the eyes of your beloved Truffles. She is truly a part of your heart and soul, never, ever to part from you. Love and purrs from Deb, the Zee/Zoey gang, and Purr Prints of the Heart. Such a beautiful and touching story! I think most of us would like to envision meeting our friends again in such a way! Just beautiful! I had eye makeup on when I arrived at work...but no more! A beautiful post; thank you for sharing it today. Simply LOVEly and true. I hope you'll consider sharing this again on National Pet Memorial Day in Sept. This is so beautiful. *sniff sniff* Lexy, hand me a tissue please. 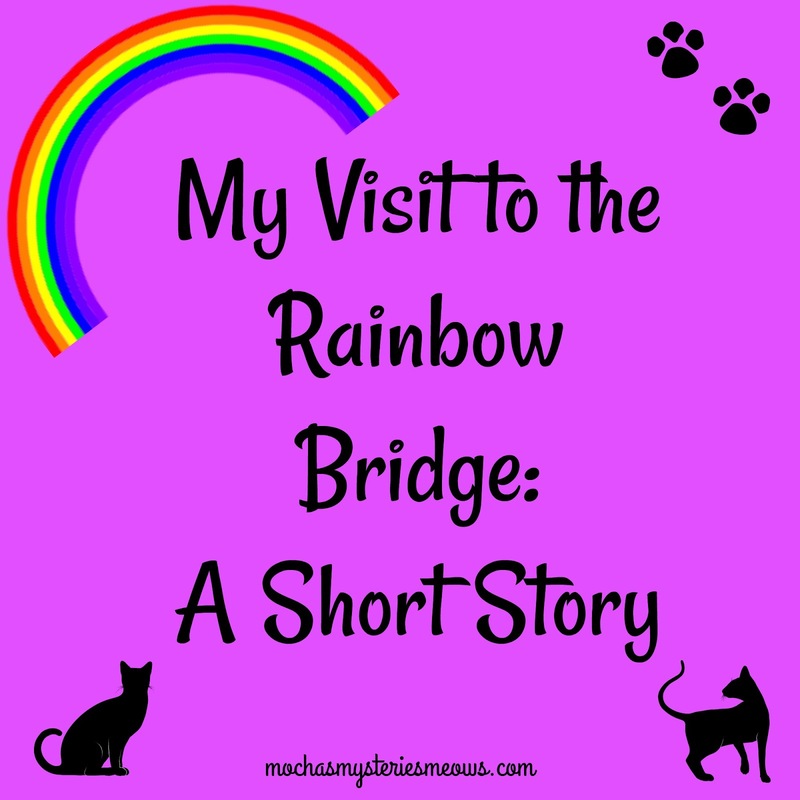 We hope the Rainbow Bridge is really like that - it sounds so beautiful the way you described it. No Tara? I'll bet she was relaxing at Rudy's Spa with Pepi Smart Dog who greets all newcomers to the Rainbow Bridge in his golden pram. Seriously, TW knows how you feel about Truffles. Sending love to you today as you remember your angels. I have not dreamed about Dash. I don't know if I could ever recover if I did. This is THE most brilliant story. So beautiful even if I am crying all over again. @#%^ it! Now I'm sobbing. I can't help but think about spending just a few more minutes with Kitty. I'm sorry. 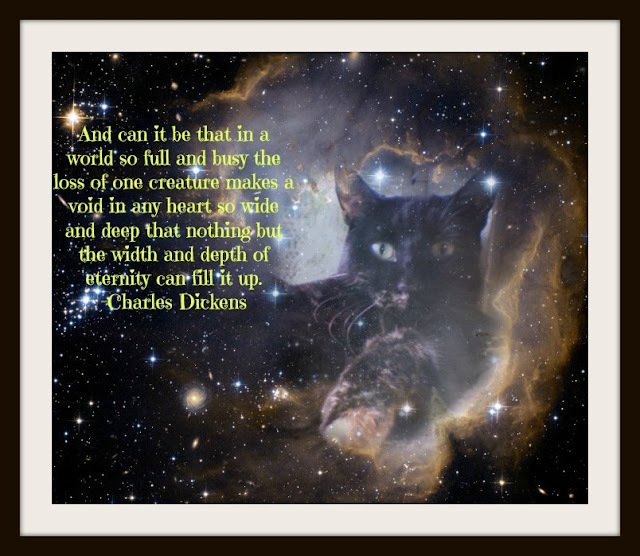 I don't have the words to comment on how moving this post is - but you perfectly captured all the complex feelings we have regarding the kitties we've lost. I truly hope that come submission time for BlogPaws and CWA - you'll remember to submit this post. I'm adding it to my list (for BP ... I'm not a member of CWA). This was such a beautiful share. Thank you ! I read through tears, but I thank you for this beautiful piece, Melissa. We never forget them--not a single one!